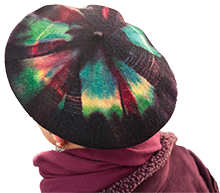 Zen Warrior Berets are hand-dyed in layers of vibrant and permanent color, using a true resist process, often called tye-dye or tie-dye. This artistic embellishment puts a lively new twist on a classic and practical hat, with the warmth and water-resistant qualities of soft, natural wool. Zen Warrior Berets are knitted in the Czech Republic, where they have been manufacturing the finest berets for hundreds of years. In addition to the Zen Warrior Beret, other wearable art, including hand-dyed cotton and rayon clothing, is offered. The hand-dyed cotton apparel is fully immersion processed, layered one color at a time, by artist Tracy Lea Landis. All T. Landis Designs cotton clothing is machine washable. Principle product is the Zen Warrior Hand-Dyed 100% Wool Beret. Copyright 2019 Tracy Lea Landis All applicable rights reserved.